One of the names that I kept seeing when in Phoenix was Tucson’s Presta Coffee. So, when I ended up there a week later at the end of my road trip through eastern Arizona/southern New Mexico, naturally I paid Presta a visit, calling in on the original branch in the Mercado San Augustin (Saint Augustin Market). The market occupies a lovely, large, open rectangular courtyard with shops and restaurants on all sides (like an outdoor Mackie Mayor if you know Manchester). Presta has a long counter in one corner, with seating available at the counter itself and in a (non-exclusive) seating area off to one side. You can also take your coffee out into the courtyard where there are plenty of tables. Compared to Presta’s flagship branch, the coffee service is limited, with the 120PSI blend being served from a concise espresso-based menu. There’s also a single-origin on batch brew which changes at least once a day. There is no food or cakes, but you are welcome to bring things in from any of the shops/restaurants in the market to have with your coffee. A roaster with two coffee shops, Presta Coffee has been going for five years, with this, the Mercado San Augustin branch, the original. The second, flagship branch is north of the city centre on 1st Avenue. It used to house the roastery, but that recently moved to new, dedicated facility. The Mercado San Augustin branch, meanwhile, is just west of the Santa Cruz River in the Menlo Park district, having the distinct advantage of being a half-an-hour stroll along the river from my hotel. It’s also at the western terminus for Tucson’s tram line. On the corner of Congress Street and Avenida del Convento, the market has several gateways/doors in the various sides, but I’m choosing the large gateway on Avenida del Convento as the front. This puts Presta in the back left-hand corner, although you’ll need to keep your eyes peeled: I missed it the first time around, although the espresso machine in the open window facing the courtyard is the key giveaway (in my defence the sun was right behind it). A set of double doors in the middle of the back wall will lead you to the right-hand end of Presta’s counter, although a more logical entrance is the door in the left-hand corner. Turn right, and you’ll end up at the till which is at the short end of the counter at the far, left-hand end. You’ll also find the flasks for the batch-brew here, while there’s a small retail selection, selling the espresso blend, decaf and various single-origins. Meanwhile, the espresso machine, grinders and batch-brewer line a work surface along the windows opposite the long side of the counter. Alternatively, entering from the parking lot behind the market through double doors in the back wall, you’ll come between counters selling ice cream (right) and cakes (left) and find Presta directly ahead. The C-shaped counter runs parallel to the back of courtyard. There are two chairs at the short end on the right, with six more arrayed along the long side, which, if you like watching espresso being made, is the best place to be. Alternatively, there’s an indoor seating area opposite the till, with five four-person wooden tables, plus a three-person table tucked around the corner. Finally, you can sit in the courtyard, which is lovely, with multiple tables scattered around, some under the shade of several mature trees. I started with a cortado, the complex, fruity notes of the 120PSI espresso blend coming clearly through the milk, yet at the same time being largely in harmony with it, making for an excellent introduction to Presta’s coffee. I’d hoped to have breakfast, so went next door to La Estrella Bakery, where I picked up a cherry pie/turnover and a nameless, but extremely tasty pastry/bun to go with my coffee. Both were soft, the cherry pie in particular bursting with flavour, the filling having a jam-like consistency. The bun, meanwhile, wasn’t overly sweet. I bought a bag of the naturally-processed Brazilian Espirito Santo, which was the coffee on batch-brew. It matured nicely in my Global WAKEcup as it cooled. I returned two days later, trying the 120PSI as an espresso, which was served on a wooden tray with a glass of sparkling water. Beautifully balanced, it delivered on the fruity complexity promised by the cortado. 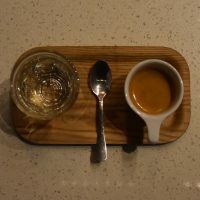 This entry was posted in Cafe/Roaster, Coffee Gardens, Coffee Shops, Evening Opening, Food Halls/Markets, Laptop Friendly, Retailers, Tucson and tagged include, Presta, USA2019-01 by Brian Williams. Bookmark the permalink.